Although e-book readers are now not hip anymore, in my opinion, they still have a number of advantages against normal tablets. The fact that the manufacturers sticks just so hard to the 6 “form factor is in my eyes the problem. As an e-book reader’s intended primarily for reading books, you should really be able to view the contents of a classic book page at one time. 6” aren’t not enough for this. 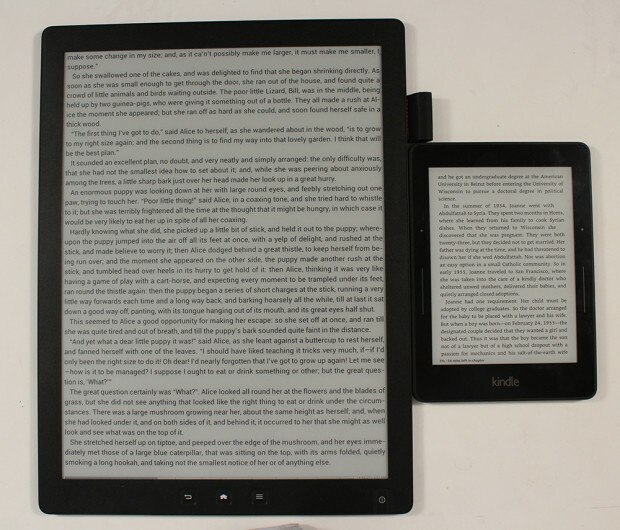 A far bigger display now Good e-Reader offers with its 13.3″Android E-Reader at Indiegogo. 13.3″ is obviously a whole lot more than a typical paperback. To justify the additional surface now, of course, you need other application scenarios. So the reader is not only used to read comic, He is equipped with a Wacom technology display that can be painted with a pen. Whether the 1024 pressure levels can play to their strengths in a display that only can display 16 shades of gray, however, is a good question. The technique of the Good e-Reader seems to be familiar. Visually, it is like the only competitor that comes along with the same screen size, the Sony DPT-S1. Both work with a 13.3” display fitted with a Mobius e-ink panel and 1600×1200 pixels resolution. These are just about 150 dpi, spread across the display. Generally that should be enough for a good typeface, but can’t compete with the current models like Amazons kindle. Battery and storage are also identical. So you could still think that this is the sony reader with other software. But it seems not to be quite so, as another CPU is used. The Sony DPT-S1 works with an ARM Cortex A8 1GHz single-core processor. 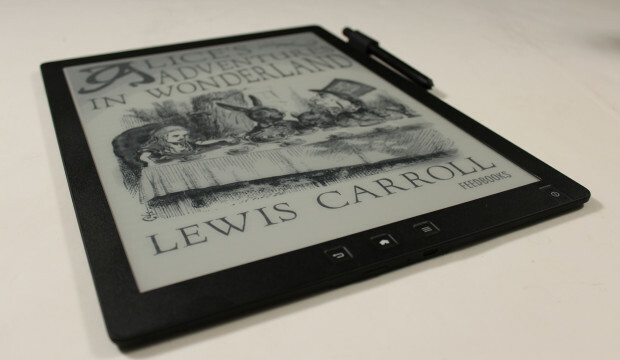 Good e-Reader uses ARM Cortex-A9 processor, which also has a single core and 1 GHz. The base of the Good e-Reader seems to me a Netronix reader. It’s not an exclusive in-house development. That the Good e-Reader is an already finished device must not be a disadvantage. The risk of developing a complete new hardware are essentially higher than buying a already developed and produced product. Let’s come to the next to the next big selling point besides the display size. The reader should be equipped with a normal Android. So you can rely on tons of apps. Sounds good, right? However, what is often overlooked here is the fact that most Android apps doesn’t make fun on an e-book-reader. I’ve rooted a Sony PRS-T1 by my self and installed a normal Android launcher. It’s quite nice, so play around with it. But the sluggish display ensures fast that you are annoyed by it. Spotify can indeed start faster on your smartphone. Also, most Android apps for viewing documents are often overloaded with superfluous animations that will spoil to operate on an e-book reader. A cool page-turning animation on a smartphone or tablet is chic. On an e-reader it is only waste time and the flickering page refreshes can drive you crazy. A rudimentary open system is of course a good thing. I just wonder why they just relies on an ancient Android 4. This is already 4 years old. To hope that the community will tailor a current Android for the reader, is a bit cheeky. About the display size you can also discuss. Personally, I would use these display sizes only for reading comics. I do not want to paint black, but with 16 levels of gray that’s probably a bit monotonous. Maybe you can put on the reader two pages side by side. That would be fine. At a price of $ 699 the Good e-Reader is still $ 100 cheaper than the Sony reader, yet it is not a bargain. After all, the risk of a financial crash landing seems to me manageable, because here indeed ultimately only a certain quantity has to be ordered from a manufacturer. We have to wait if the software is ok. For my taste, but the reader could be fun but is too expensive. For the money you can almost get an iPad Pro and that should be miles ahead regarding versatility and performance. Even if you had to waive an e-ink display. Normal android apps on an e-ink-display doesn’t look good.